Your group tailgate expects every one to bring food. You know Sarah will have that amazing, homemade buffalo chicken dip she stayed up late last night cooking. And Helen, of course, spent the week making a cake... in the shape of a Tiger.... with made from scratch icing. Between packing, traveling, getting the kids ready and making sure they have on two orange shoes versus one, and a husband who spent his time picking out the perfect adult drinks to take instead of snacks.... you have nothing to bring to the tailgate, and it's time to hit the road and head to Clemson. No worries. We have a strategy we like to call... 'fake it till you make it'. Grab a few of your Clemson serving dishes, choose one of these quick and easy tailgate snacks below, and start practicing your "I'll never share my recipe..." speech. Who doesn't love Pimento Cheese in the South? You can easily find it in the deli section of most major grocery stores, or a popular Southern brand of Pimento Cheese can be found in your grocery store's cheese isle. Grab a bag or two of your favorite Pretzel Chips, scoop the Pimento Cheese into one of your fancy dip bowls, and viola - a delicious, homemade-looking dip that is easy to grab on the way to your tailgate. Like #1, this is another great 'fake it till you make it' snack. Most major grocery stores have 'homemade' chicken salad at their Deli (we recommend Publix). Grab a big container of the chicken salad and a box of your favorite flavor of Ritz Crackers (you can never go wrong with the original). Scoop out the chicken salad into a serving bowl, place on a serving dish and surround with the crackers oh so artistically. Make sure you pack a small spreader knife to stick in the chicken salad. 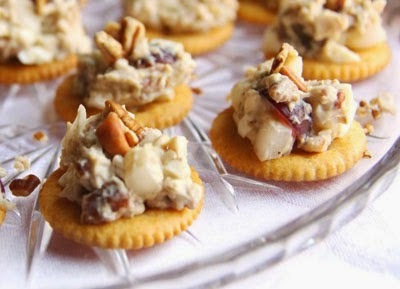 You could also pre-spread the chicken salad onto the crackers and top with an almond (like in the photo below), but who has time for that?! "This chicken salad is amazing...." To which you reply, "Thank you! It's a secret recipe!" 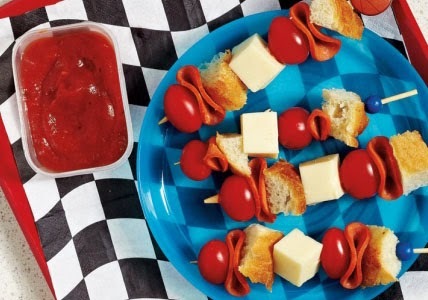 This next tailgate snack is pure genius and will be a favorite of the kids at your tailgate. So simple and fun. What you need: Small bags of Fritos (either buy small bags, or take a big bag and split it up into Ziploc sandwich bags), shredded lettuce, Mexican blend shredded cheese, Sour Cream, and chopped tomatoes. Add other ingredients you like in tacos, like black olives, green onions or salsa. Place your ingredients out in serving dishes (paper plates and bowls work too), and everyone makes their own 'walk-around taco'. Take a bag of the Fritos, and then add in the other ingredients as desired - use the fork to mix it up some, and now you have your own taco in a bag. Super delicious, not to mention easy clean up. Buy a few bunches of bananas, a jar of peanut butter, and a box of Rice Krispies cereal. Slice, or just break with your hands, the bananas into small segments. 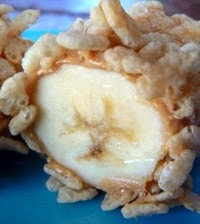 Cover them in peanut butter, then roll them in the Rice Krispies. Add a drizzle of caramel or chocolate sauce if you've got a sweet tooth. And speaking of bananas...You need: small clear plastic cups, banana pudding (buy it premade from grocery bakery), bananas, vanilla wafers, and cool whip. 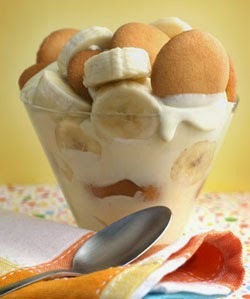 Layer in each plastic cup: coolwhip, bananas, 1 broken up vanilla wafer cookie, banana pudding. Continue until you reach top of cup. Another easy, quick treat to satisfy the sweet tooth. 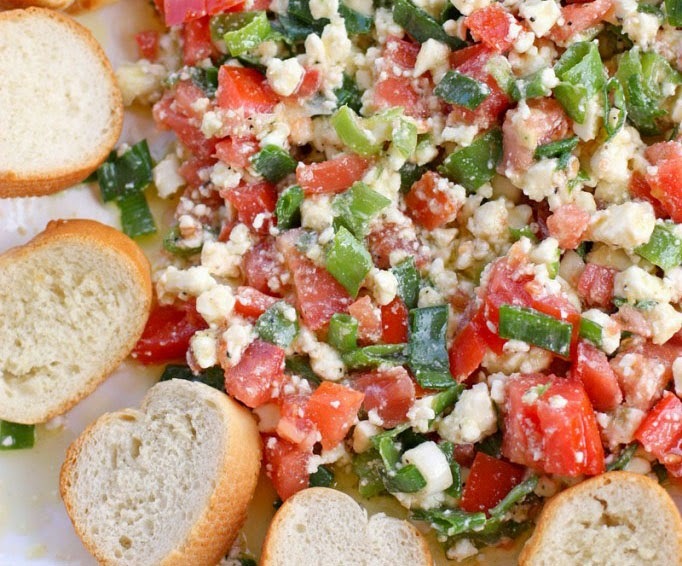 This dip tastes like you spent a long time putting it together, but it's literally taking the ingredients and throwing them together in a platter. Line a platter with about 1/3 cup olive oil - your preference on how much you want, just make sure platter has thin covering. Throw in diced tomatoes (about 2 tomatoes), chopped green onions (about 4-5 green onions), 8 oz. (or more) crumbled feta cheese, and about 2 to 3 teaspoons of Cavender's Greek seasoning. Mix it all together and serve with baguettes. These would be perfect for a tailgate breakfast menu, but who doesn't love donuts any time of the day? Sure, this isn't exactly 'homemade', but everyone at your tailgate will be singing your praises with this one. 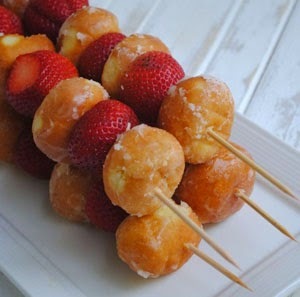 It can't get any simpler.... strawberries and donut holes on skewers. Boom. Done. Delicious. Another one guaranteed to be a hit with the kids at the tailgate, and you could probably recruit them in helping you make them. 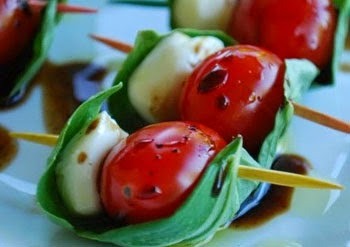 On a skewer or toothpick - pepperoni, cube of mozzarella cheese, cube or pinch of focaccia bread, grape tomato... then grab a jar of pizza sauce from the pasta isle in your grocery store to put in a bowl for dipping. You can mix and match the types of ingredients - add mushrooms or different types of cheeses. 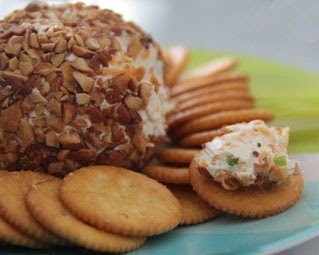 This snack requires a little more prep, but the final result will fool your tailgate friends into thinking you spent much more time crafting the most delicious, and perfect cheese ball they have ever seen. Mix 8 oz. softened cream cheese, 1 cup grated cheese, 1.5 tbsp ranch dressing mix, and 3 green onions chopped. Using wax paper, roll the mixture into a ball. Next, roll your ball on the wax paper on roasted, chopped almonds until the mixture ball is covered in almonds. Wrap the ball tightly in saran wrap and store it in your cooler on ice (or in fridge) for about an hour - then it's ready to be placed on a platter and served with your favorite crackers. 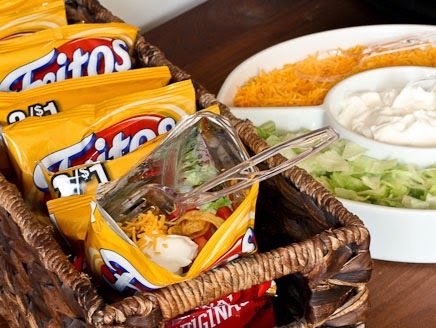 What are your go-to quick, grab and go tailgate snacks and recipes? Yum! Love pimento cheese with pretzel chips! This recipe below is one of my go-to tailgate recipes. Last weekend I just brought the ingredients and made it right at the tailgate... super easy! Then I just chilled it in the cooler for a bit and it was ready to eat.